you'd be stricken blind. " 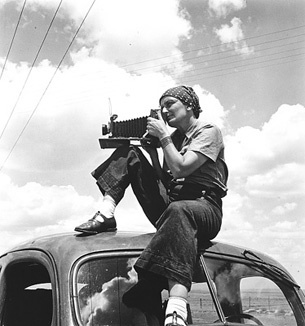 Dorothea Lange has undeniably become one of the most significant American photographers. Her photographs give an overview of her social outlook, the depth of her creative vision and her place in the development of documentary photography. The major turning point in Lange's career came with the Great Depression and the overnight social devastation of millions of ordinary people. In 1953 she joined the Farm Security Administration (FSA) and reported on living conditions in the rural areas of the USA. Her motivation to photograph the human consequences of the depression came from a burning desire to change the horrendous social condition the depression had produced. 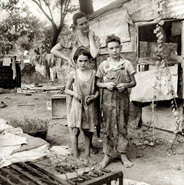 Dorothea Lange documented the bitter poverty of migrant workers and their families. Her pictures not only showed the hopelessness and despair, but also the pride and dignity with which people endured their circumstances. One of the most famous and most frequently published photographs of the (FSA) Projects is "Migrants Mothers", the portrait of a Californian migrant worker with her three children. The photograph has become something of an iconic image. The mother holds an infant in her arms and two slightly older children rest their heads on her shoulders, seeking protection, hiding their faces from the camera. The mother's face is marked by wrinkles and etched with worry directed in the distance. What do you think about the photograph? 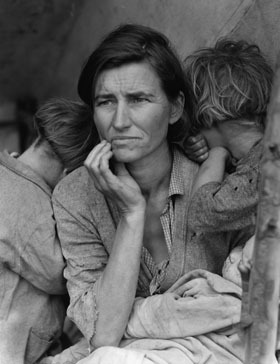 Has Dorothea Lange's approach influenced your photography in any way ? Have you shot in a similar style? The woman and children fill the photographic frame leaving the rest of the figures bodies outside the image frame. Very little of the surroundings is revealed, the background appears to be canvas, and part of a wooden support is visible in the foreground. The mother becomes the centre of a visual triangle echoed by the many angular forms found throughout the image. This photograph resounded with the American people. Every one could sympathise with the mother's concern for her children and the image itself reminds of Madonna and child. 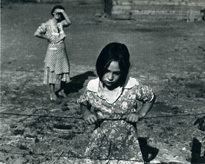 Lange's deep commitment to her work and the subsequent intensity of her photographic experience resulted in an image so strong that Roy Stryker, the director of the FSA at the time, described the photograph as one that had potential to both excite and disturb the viewer. Words were unnecessary, according to Stryker (Ohrn 1980), but Lange's brief title reinforces the image. It is the sense of dignity and strength despite immense physical suffering combined with artistic excellence that makes this image so powerful. The human and aesthetic elements merge, and a photograph initially used to remedy the social injustice in the 1930s, survives today as a work of art. 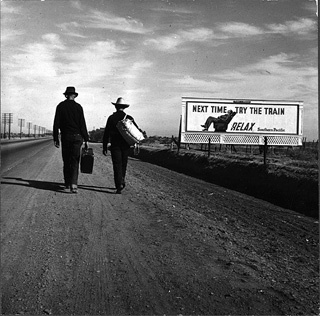 To date Dorothea Lange's images remain among the most complex and deeply emotional photographs of working people ever made. They say much about the human condition. Her subject are not passive victims, but proud, dignified people determined to overcome all difficulties, and confident that they can. Lange’s photographs are so evocative that they form the principal component of our contemporary visual memory of the Depression. "... it is not a factual photograph per se. The documentary photograph carries with it another thing, a quality in the subject that the artist responds to. It is a photograph which carries the full meaning of the episode or the circumstance or the situation that can only be revealed - because you can't really recapture it - by this other quality. There is no real warfare between the artist and the documentary photographer. He has to be both." 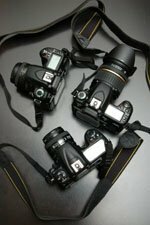 Has D. Lange approach influenced your photography ?